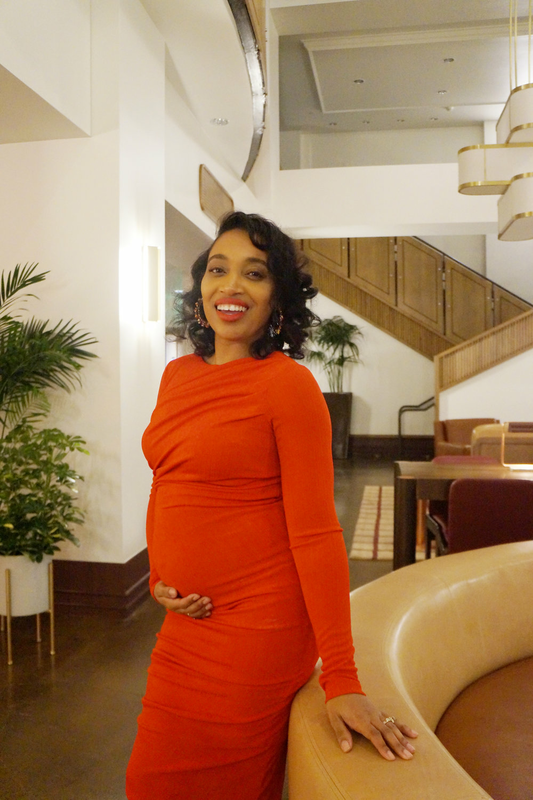 I’ve been so grateful and appreciative of the thoughtful comments on my pregnancy “glow” during this pregnancy. There is an indescribable beauty that is exuded during pregnancy for me. Pregnancy brings a deeper meaning to the idea of beauty. Knowing that you are able to carry, nurture, and bring forth life through your body as a woman takes my breath away. It makes it easier to embrace your inner beauty so that your outer beauty is reflected. During this pregnancy, I’ve taken a few simple steps to ensure I look and feel great and I’d love to share it with you. You maybe persuaded by pictures on Pinterest to “slay” while pregnant. I know we are all enticed by the gorgeous women mixing prints and being daring while pregnant. But, for the average woman like myself, I suggest keeping your style simple. Try to wear pretty solid colors that accentuate your beauty and your body. I particularly love garments with draping and lines that gravitate the eye towards areas of pregnant woman’s body. Hormones during pregnancy drive the wheel of beauty. However, you don’t have to allow it to steer you into bout of depression because of a pimple or two. During your pregnancy, skin care regimens like exfoliating, facials and moisturizing your skin will help you with a flawless pregnancy glow. Drinking more water also helps with flushing out toxins and keeping your skin hydrated. Remember those hormones?! They sometimes whisper to you and say “You’re hair looks terrible” or “You should really put forth an effort and put on some makeup”. Well sometimes, it’s the truth. Due to nausea or sickness, you just don’t feel like thinking about doing hair is too much. I promise you something.. taking an extra 30 minutes to an hour to do your hair and makeup makes you feel so beautiful. You don’t have to have a 20 step routine either. Remember simple is more. Exercise releases hormones like endorphins, serotonin and dopamine that make you feel happy. There is indeed a correlation between happiness and expression of beauty. So move you and the baby bump to keep yourself feeling beautiful. Check with your doctor first. I’m sure that simple exercises like walking or swimming allows you to move your body and remain healthy while you are growing your little one. Pregnancy is a joyous time that you should cherish. Remember that you are pregnant and you are powerful. You are bold and you are beautiful. Go forward in your boldness, in your beauty and in your contentedness.